While this month has been crazier than usual—working longer hours and trying to balance a few other projects, I have had some time to sample the latest movies to hit DVD. While I already reviewed both Superbad and Pirates of the Caribbean: At World’s End over the summer, the jump to DVD is a true barometer of quality. Can they stand up to repeat viewings? Do they warrant a purchase? Let’s find out. What else needs to be said? This is the best teen comedy to emerge in years and holds up fairly well compared to other Judd Apatow productions such as Knocked Up and The 40-Year-Old Virgin. The characters in Superbad are likeable, the dialogue is hilariously filthy and there’s a heart at the center of it all, even though the film’s most staunch critics fail to see that. It doesn’t hurt that the unrated DVD version has a few extra minutes of footage not seen in theaters. As for special features, you get what you’d expect from an Apatow disc. Bloopers, a Line-O-Rama feature (this will give you a sense of how these guys hone their rapid-fire improvisational delivery) and some great deleted and extended scenes. And that’s just the single disc version. I know I praised this flick when it first hit theaters back in May, and I admit that my adoration may have been a tad misplaced. On second viewing, this film is talky, needlessly confusing and worst of all: it’s kind of boring. It was fun seeing it initially, trying to figure out the film’s twists and turns (too many betrayals!) and seeing how the trilogy would turn out. But now? It’s a bore-fest up until the finale. The main problem with the Pirates trilogy is that director Gore Verbinski and writers Ted Elliot and Terry Rossio got the idea that the initial Pirates film was a hit because of its plot and computer wizardry. False. People flocked to see Pirates of the Caribbean: The Curse of the Black Pearl because of Johnny Depp as Jack Sparrow. His speech-slurring and half-drunk swagger made Jack Sparrow one of the most fun-to-watch creations in modern Hollywood. Having Geoffrey Rush as the villainous Captain Barbossa didn’t hurt either. Orlando Bloom and Keira Knightley were just along for the ride. If there was no Depp as Captain Jack, no one would have spent their $10 on a movie adaptation of a theme park attraction. But what did the sequels do? They got wrapped up in their own mythology. So instead of a trilogy of films with character-driven plots, we have plot-driven characters. A labyrinthine series of events that serve only to split a one-film story into over four hours of pirate meetings and triple crossing. If you’re not a first-time viewer, the only thing bringing you back is the special effects, which is sad considering that this franchise was built on the performance of an actor, not on computer graphics. If you haven’t seen it and were a fan of the first two Pirates films, then by all means add this to your Netflix/Blockbuster queue. 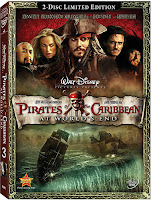 But as a repeat viewing, Pirates of the Caribbean: At World’s End is dead in the water.